The Happy City is Seoul’s new vision for 2030. 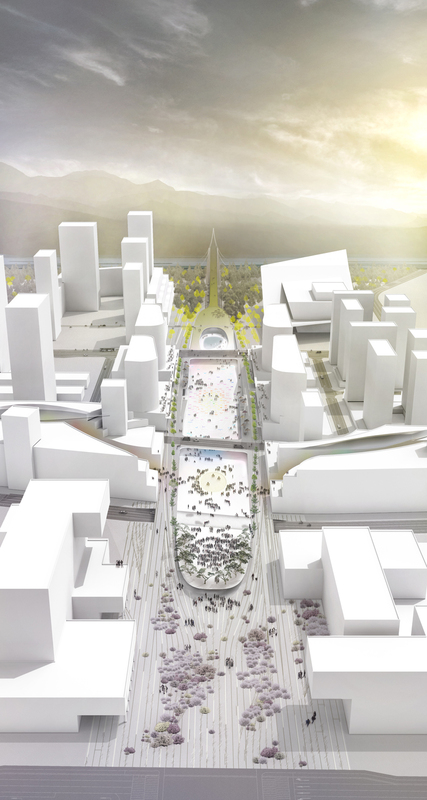 Responding to the city’s spirit, Korea Land & Housing Corporation held multiple design competitions, including the Happy City Symbolic Plaza Competition. The problem with the current location and form of Symbolic Square site has the characteristic of corridor: a path the transports users to many of the city, rather than attracting and connecting the citizens. In the case of Gwanghwamoon Square where the road and square are connected on the same level, the problem is how to control the traffic. Whenever there is an event, the cost for personnel is how to control the traffic and citizens’ safety restrict the use of square depending on the character and scale of the event, which in turn reduces the use of square. Even considering the increase in the initial cost, it is considered better in ensuring Sejong’s Symbolic Square is continuously used to increase the efficiency of square in the long-run by separating, connecting urban atrium area, commercial-residential complex area and art plaza area through pedestrian path and ensuring the square is safely used the citizens.